Milwaukee's Laborfest 2014 is in the books. And by no means was it your average, everyday celebration of labor. Oh sure, there was the usual parades. There was the usual politicians walking around glad-handing the people and showing their support for organized labor. There was the usual good food, good beer and good music. But this year was unique for a few reasons, both in general and personally. After getting bumped off of the Summerfest grounds last year due to the Harley reunion, we came back to the Summerfest grounds. Not only did we come back, we came back in force. We also had a very special guest speaker in President Barack Obama. 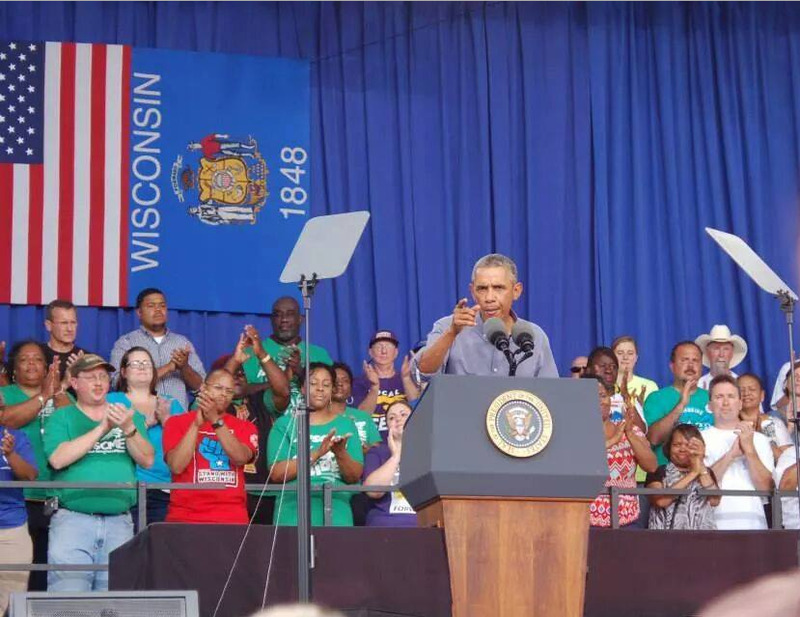 You can see the entirety of Obama's speech, as well as the opening remarks by Milwaukee Area Labor Council Secretary/Treasurer Sheila Cochran here, via Wisconsin Eye. It was also a special day for me personally. 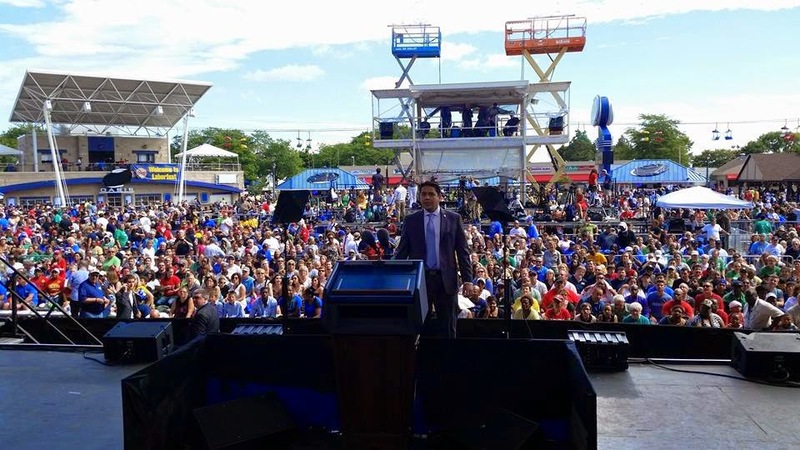 I had the distinct privilege of joining several of my brothers and sisters on the stage with the president. It gave me a chance to have a once in a lifetime experience and a new vantage point that I would not normally have. from which Obama was to speak. Courtesy of a friend, the view from the crowd. Other pictures of the day's activities can be seen through the coverage by the Milwaukee Business Journal. There were two other things of note about the day. Besides the presence of President Obama, there were several local leaders, including Congresswoman Gwen Moore, Mayor Tom Barrett, State Senator Chris Larson, State Representatives Chris Sinicki and Mandela Barnes and Milwaukee County Supervisors Jason Haas and Khalif Rainey. There were also several candidates, including Mary Burke, Susan Happ, David Bowen and Chris Rockwood. Notably absent from the day's events was Boss Chris Abele. It wasn't that he didn't want to be there, but because AFSCME and the Milwaukee Area Labor Council made it explicitly clear that he was not welcome because of his attacks on workers and workers' rights. Also notable for their absence were Milwaukee County deputy sheriffs. Again, it wasn't that they didn't want to be there helping to provide security for the President of the United States, but because Sheriff David Clarke was again politicizing his office by refusing to do his job in providing security for the the Democratic president. Abele also would have faced tough questions from concerned citizens about his promise to release all those pesky John Doe I records. Summer has past now, Chris.